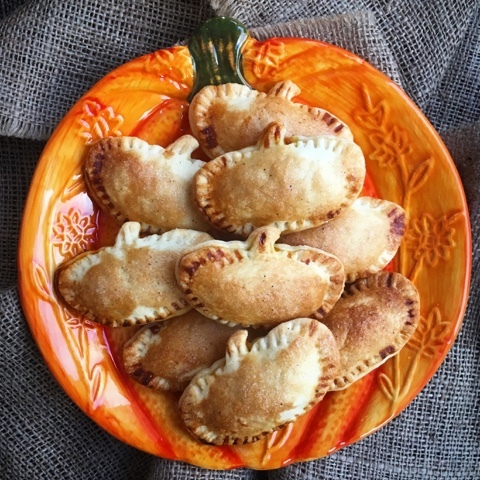 Celebrate Halloween or Harry Potter and Hogwarts with these quick and easy to make Pumpkin Pasties using canned Pumpkin and my Pumpkin Spice Mix. One week on and our fortnight's holiday in Orlando now seems but a distant memory. Suffice to say that we had a fantastic time when we finally got there. Hurricane Matthew intervened so we got an unintentional mini break in New York! You can read more about what we got up to in my What to Eat in New York City post. Whilst many head to Florida for Disney, much of our excitement was about a wizard called Harry rather than a mouse called Mickey. 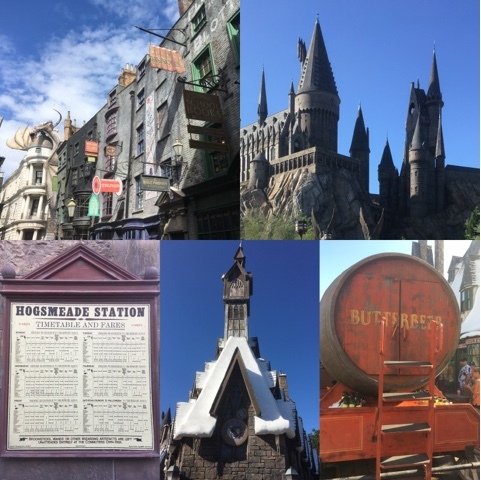 The Wizarding World of Harry Potter is spread across the two Universal theme parks with Hogsmede and Hogwarts in Islands of Adventure and Diagon Alley at Universal Studios. We've already been to the W.B. 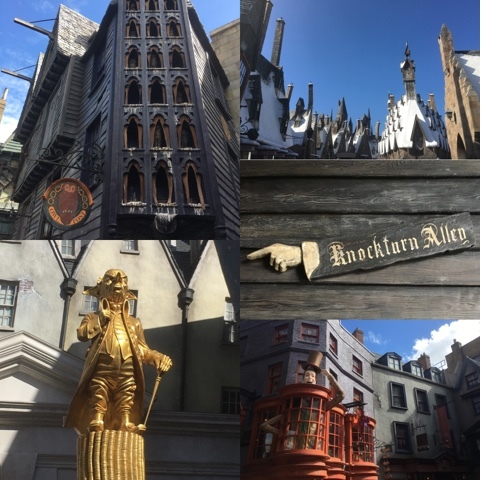 Studio Tour in London and were blown away by the recreation of Diagon Alley there, but Universal have taken the construction of the Wizarding World of Harry Potter to a whole new level. The attention to detail is simply amazing. You could literally just wander around for days and still not see everything that there is to see and that's without going on the rides. It's a Potterheads idea of heaven! There's a headline ride in each park 'Escape from Gringotts' in Universal Studios Florida and 'The Forbidden Journey' in Islands of Adventure. 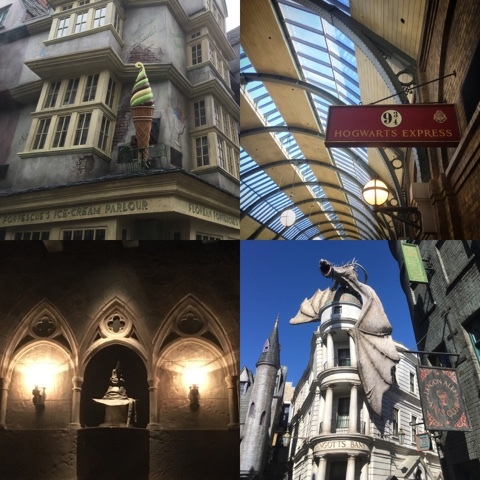 There's no fastpass queue for any of the rides but in all honesty the queueing is a huge part of the whole experience as you encounter the Goblins in Gringots, the Sorting Hat, the Mirror of Erised, talking portraits, Dumbledore's Office, the Griffindor Common Room and much more. There's also a 'tour only' line so you can head back with your camera and explore all the detail at your leisure. Both rides are truly wonderful totally immersive experiences. 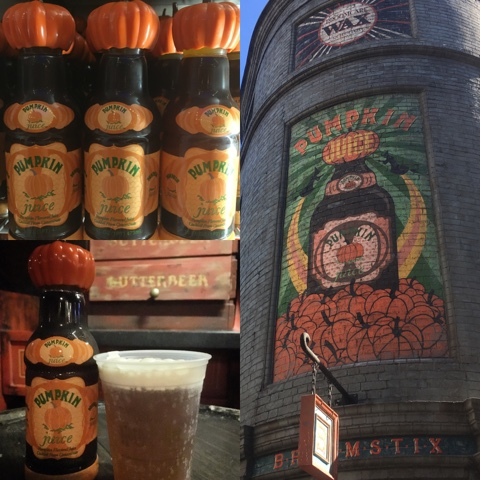 No visit would be complete without stopping for refreshments at The Three Broomsticks or The Leaky Cauldron. Sweet treats a plenty in Hogsmedes legendary Honeydukes - chocolate frogs, Cauldron Cakes, Treacle Fudge, Fizzing Whizzbees and of course Bertie Bott’s Every-Flavour Beans. (I did a live Facebook video from Honeydukes which you can watch here) Florean Fortescue’s Ice-Cream Parlour provides icy treats in Diagon Alley where I opted for a Peanut Butter and Strawberry Ice Cream Sundae. 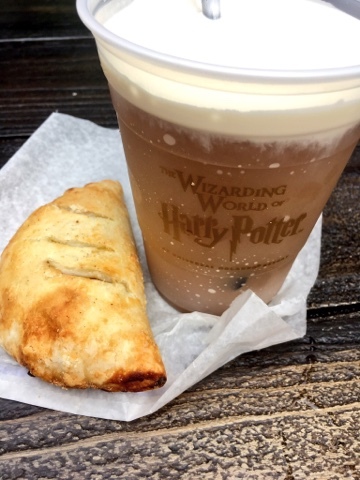 The main event for any fan is of course tasting Butterbeer. I'd tried it when we did the London studios tour and really didn't enjoy it at all. However I'm not sure if they've changed the recipe or if it tasted better in the sunshine but I liked it much more this time round. You can get it in traditional or frozen form and with or without a foamy head. I was super excited to try Pumpkin Juice and it didn't let me down. Way better than I had expected and such a gorgeous bottle. A Pumpkin Pastie was also on my to eat list. I'd expected them to be savoury but they were sweet like Pumpkin Pie. Whilst they were fresh in my mind and to coincide with Halloween I decided to have a go at making my own. I actually struggled to track down the Canned Pumpkin for the recipe. It seems to be on sale in larger supermarkets from the Central Belt southwards but alas does not appear to have made it onto the shelves in the North of Scotland. Luckily a Canadian friend who orders it in bulk online stepped in and saved the day with a can. I owe you big time Julia! 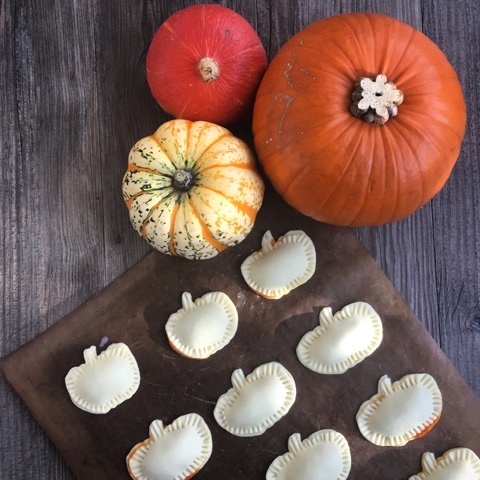 I used a pumpkin shaped cookie cutter to make mini pasties but they went a wee bit out of shape so a traditional pastie might be better and would allow the inclusion of more filling, which is always a good thing. Roll out the pastry until its 1/16" thick and cut out out Pumpkin shapes and place them on a greased/lined baking sheet. Mix together the pumpkin, pumpkin spice and sugar. You can adjust the quantities to your own taste. Put a teaspoonful of pumpkin mix in the middle of each pastry pumpkin. Brush around the edges with milk and place a second pastry pumpkin over the top. Seal the edges of the pumpkins with a fork. Glaze the pumpkins with milk and sprinkle the tops with a little castor sugar combined with pumpkin spice. You can use shop bough Pumpkin Spice Mix or make your own. I used the following recipe. The excess can be stored in a spice jar. For further Harry Potter food inspiration be sure to check out my recipe for Treacle Tart, Lisa's for Hagrid's Rock Cakes and Grace's wonderful Harry Potter themed Lunch Box which includes Edible Broomsticks, Babybel Owls and Wizard Hat Sandwiches. 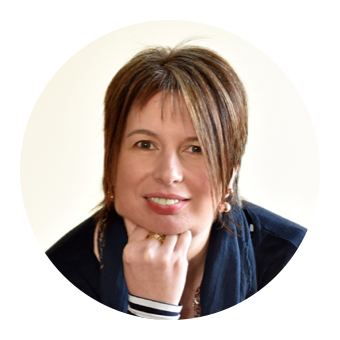 Such a fab idea Claire, these look awesome! 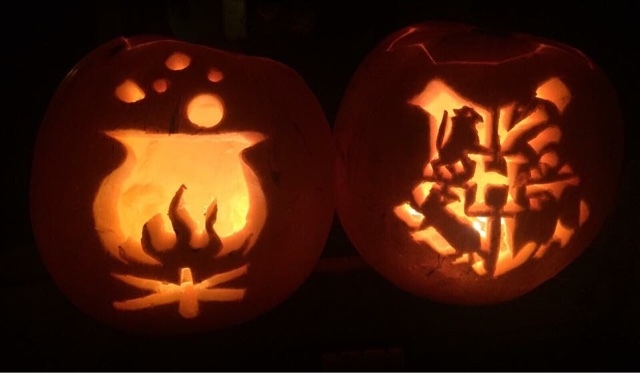 We're big HP fans in our house too, can't wait till my son is old enough for Harry Potter parties....! Sounds like a great place to visit. The pastries look fab too. By the way, I've seen pumpkin puree in the American section in Tesco. Might be worth a look.